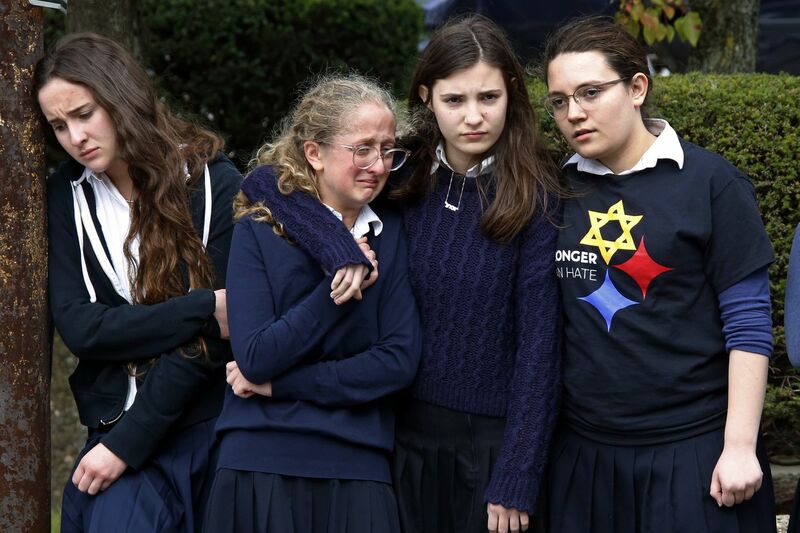 Students from the Yeshiva School in the Squirrel Hill neighborhood of Pittsburgh pay their respects as the funeral procession for Dr. Jerry Rabinowitz passes their school. Rabinowitz was one of several people killed in a mass shooting while worshipping at the Tree of Life synagogue last October. Even though every state in the Mid-Atlantic region passed gun safety laws in the wake of the Parkland, Fla., massacre last year, Pennsylvania’s legislature, controlled by Republicans who tremble at the thought of annoying the gun lobby, only passed a single bill related to gun violence. That one law, the first antiviolence legislation in more than a decade that deals directly with firearms in Pennsylvania, forces people with a domestic violence ruling against them to more quickly surrender their guns. It’s welcome legislation, but it was the only survivor of dozens of bills introduced in Pennsylvania’s legislature — ranging from an assault weapons ban to requiring background checks for people who want to buy rifles and shotguns. As the new legislative session opens in Harrisburg, legislators should recall the slaughter of 11 people at the Tree of Life synagogue in Pittsburgh by an anti-Semite using an assault rifle. The massacre of people in their house of worship as well as Pennsylvania’s tragic statistics on firearm deaths — in 2017, our state saw the fourth most firearms deaths in the nation — should inform the firearms debate. Some legislators are paying attention. Among them are a few new members who will hopefully bring new energy to the fight. Freshman Rep. Mary Isaacson (D., Phila.) introduced a bill that would ban people who have been involuntarily committed to a mental health institution from possessing guns. Rep. Christopher Quinn (R., Delaware), in his second term, would require background checks for people who buy rifles and shotguns. Freshman state Sen. Steve Santarsiero (D., Bucks), who previously served in the House, would force gun owners to store their weapons in locked containers. Rep. Tim Briggs, (D., Montgomery), who has pushed the safe storage bill for years, is expected to sponsor it in the House. Of all the gun-related bills that have already been introduced for this two-year session, the safe storage bill is the least controversial. Safe storage laws work. Massachusetts, which requires guns to be locked up whenever not in use, has the strongest safe storage law in the nation. As a result, only 9 percent of youth suicides there are committed with guns, compared to almost 40 percent of youth suicides in the nation, according to data from the Centers for Disease Control. The Giffords Law Center reports that between 2005 and 2014, about 20,000 children were killed or injured with guns. More than 4 million children not only live in houses where there are guns, but most also know exactly where those guns are located. No one should have to die to get the attention of state legislators, but they do die, every day somewhere in this state. How much more bloodshed does the legislature need before they take action on reasonable gun laws?